Welcome to my website. I really hope that you enjoy the time that you spend here. I’m a wildlife artist but I’m more than that…….I celebrate beauty through my art and I want to share that with you. We live in a world where we are so busy that we can easily take things for granted. We often fail to stop and really look at things. Sometimes we live in a situation where beauty is hard, perhaps even impossible, to see. I try to capture the beauty of the natural world. I want you to have a little slice of beauty on your wall. I want you to look at it each day and feel refreshed. I want you to feel the same awe that I do. 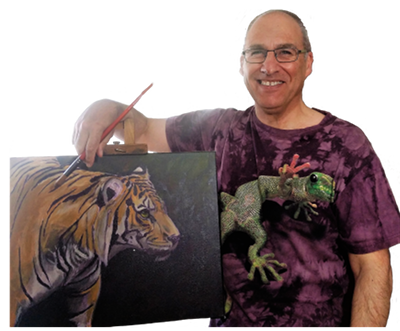 Yes, I’m a wildlife artist……but I’m more than that. For as long as I can remember two things have been a constant in my life. A love of animals and a love of drawing. I have not always been in a position to indulge those loves as fully as I might like. There have been times when I have been able to paint and draw a great deal and other times when I only manage to get time here and there. As an artist I enjoy capturing a realistic impression of my subject but I’m not interested in trying to create the realism of a photo. If I wanted to do that I’d just take a photo! Having said that I do admire artist who strive for and achieve that sort of realism. I like my subjects to be clearly identifiable but I also like it to be obvious that it is a painting. I want you to have the illusion of detail but at the same time be able to see the brush strokes, rough edges, etc. My reason for painting animals is simple. I love them and am fascinated by them. I want others to share that appreciation. I want to awaken that appreciation if I can. If a painting that I do helps a person to feel an emotion then I feel that I have succeeded as an artist whether I sell the work or not. After all art is really about communication. An additional motivator is that I find it sad to contemplate the environmental damage that we are doing to the planet. I think that art can play a valuable role in raising awareness of the need to care for and preserve life. It has been said that we will not safeguard that which we do not value. Art can help us to see the beauty that is all around us and recognise that it is worth saving. I could say that I am “self-taught” as an artist but in reality that would not be true. How many of us are self-taught in anything? We learn from others all the time as they in turn learn from us. I remember as a six or seven year old drawing with my mother. She would do Eucalypt trees that to me seemed very beautiful and detailed. It made me want to be able to recreate them. So, I undoubtedly learned from my mother. I have also learned from countless others. I have learned by trial and error. By my mistakes and little triumphs along the way. Let’s face it, being an artist is an exciting journey that never ends and we are always learning. My favourite mediums are pastel and acrylic, although I also really enjoy graphite pencils and technical pens. I’m 55 years old and happily married with no children. I play the guitar and have in recent years developed a bit of a sourdough baking habit!